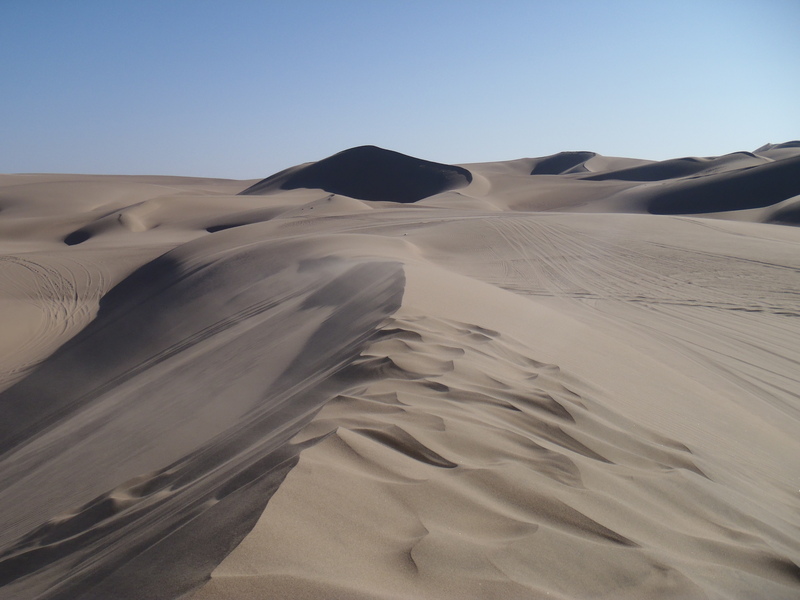 I am standing at the bottom of a huge sand dune in the middle of the desert of Ica, Peru, south of Lima. 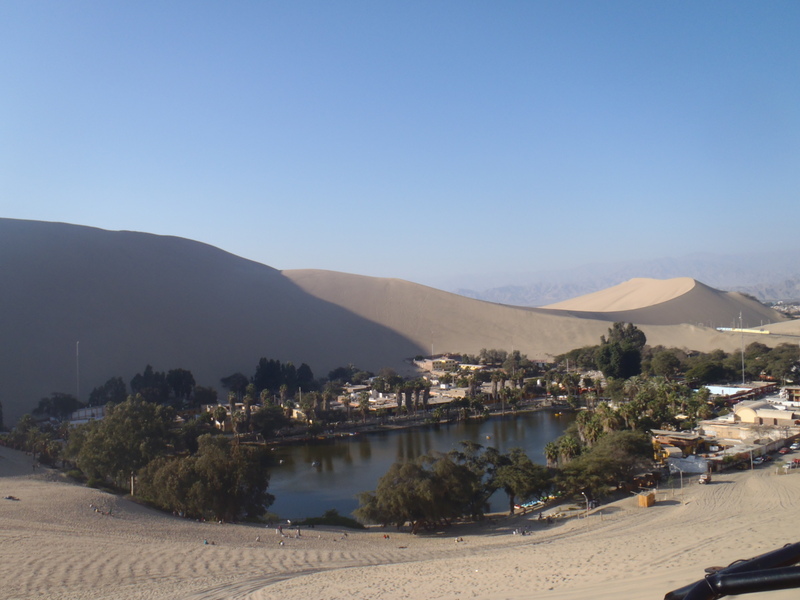 I never knew there was a desert here, but it’s real, with sand as far as the eye can see and even an oasis call Huacachina. I am now covered head to toe in a fine, white sand. I can feel it coating my teeth. Guess I shouldn’t have laughed on the way down! This is like extreme tobogganing, without getting cold! The modified snowboard uses hold-on straps. You can use your feet as brakes, but I didn’t bother. The faster the better! I’m the most daring in my family, and always go first, so I took the camera to the bottom to take pictures. 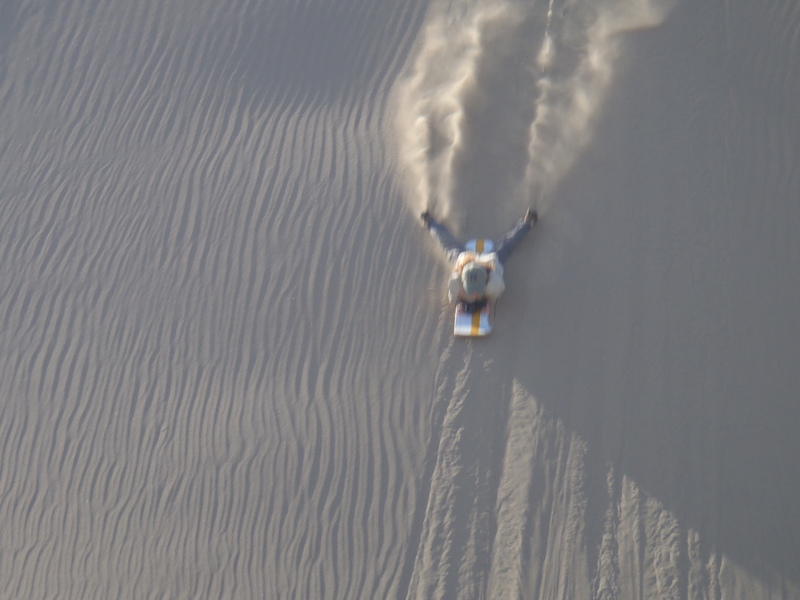 Prior to the thrilling sandboard ride, we raced around in a dune buggy up and down the hills at high speed. It was like a crazy roller coaster ride. You’re buckled in the seat, holding onto the grab bars. Wind and sand are flying through the air. Your stomach keeps dropping to your feet as you crest a hill only to plummet down to the valley and climb the next one. You can’t keep the smile off your face. Rachel says this is the most fun she has had in her life. At 10 years old, that’s pretty good. My husband and I are a few years older and we loved it too! 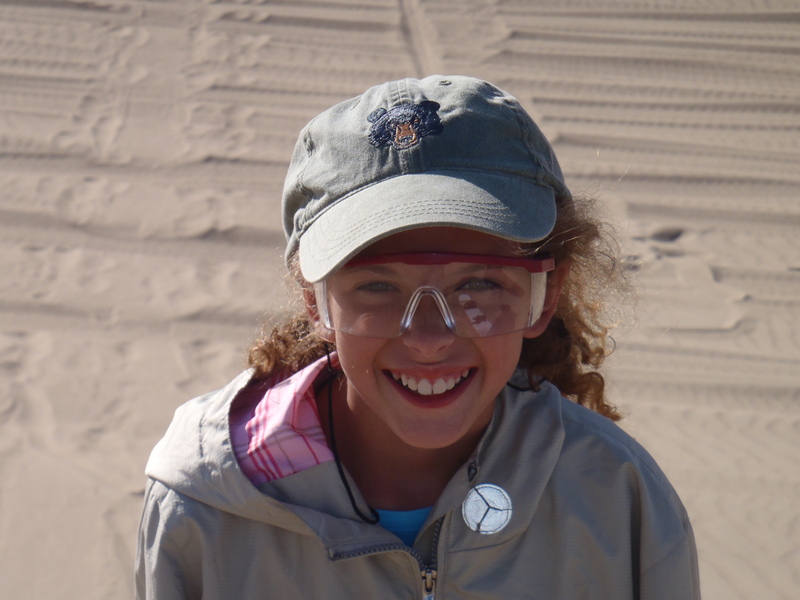 Courage Level: 2-3 – If you can handle a roller coaster, you can handle the dune buggy ride. There are straps to secure you to the seat and handles to hold onto. 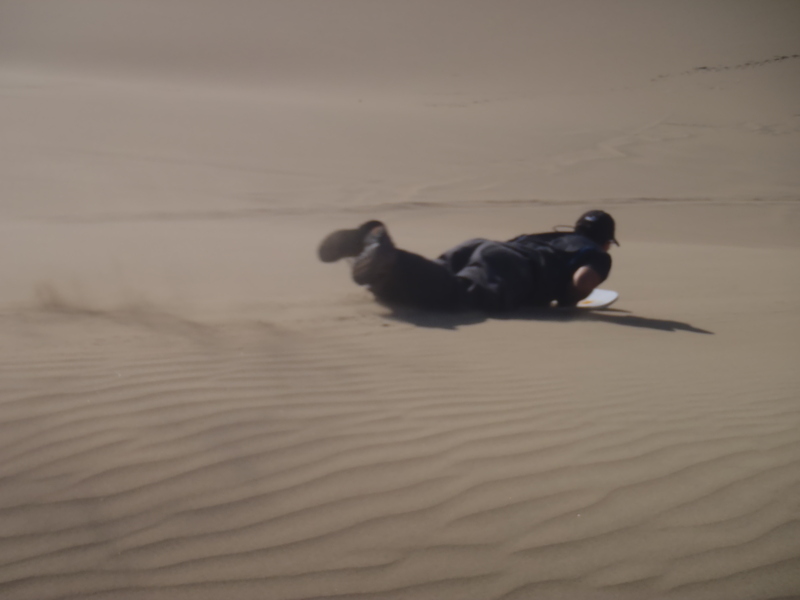 The sandboarding may be a little more challenging because you are lying on your stomach looking down a very steep hill. However, you do have the ability to use your feet to slow you down. I just didn’t use them! Fitness Level: 1 – You don’t need to be in any kind of shape to do this. 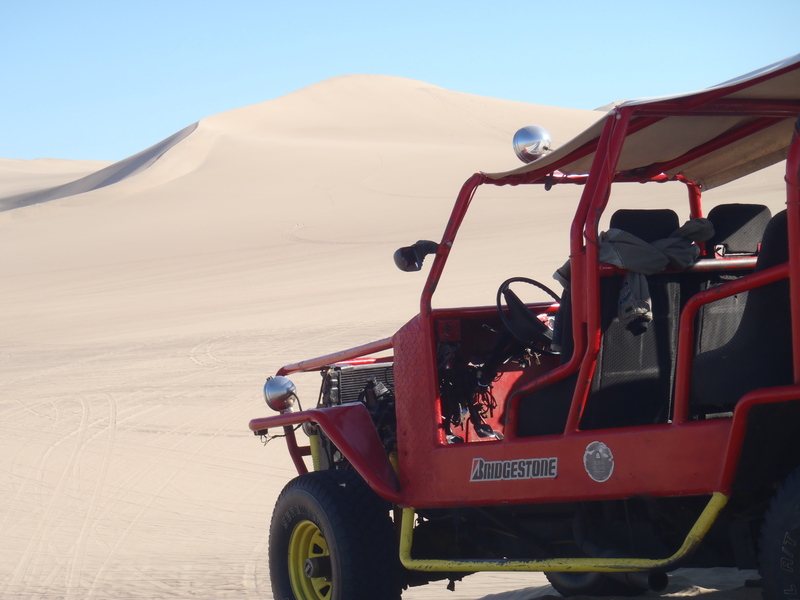 Sitting in the dune buggy is easy physically, as is sliding down a hill. You don’t have to climb back up. We used the Olympus Stylus Tough camera, which is shock proof. That thing can take a real beating. It even survived the ride down the dune in my pocket and being covered by sand. I wouldn’t try this without a shock proof camera! Wear long pants and closed-toe shoes to protect your skin from the sand. 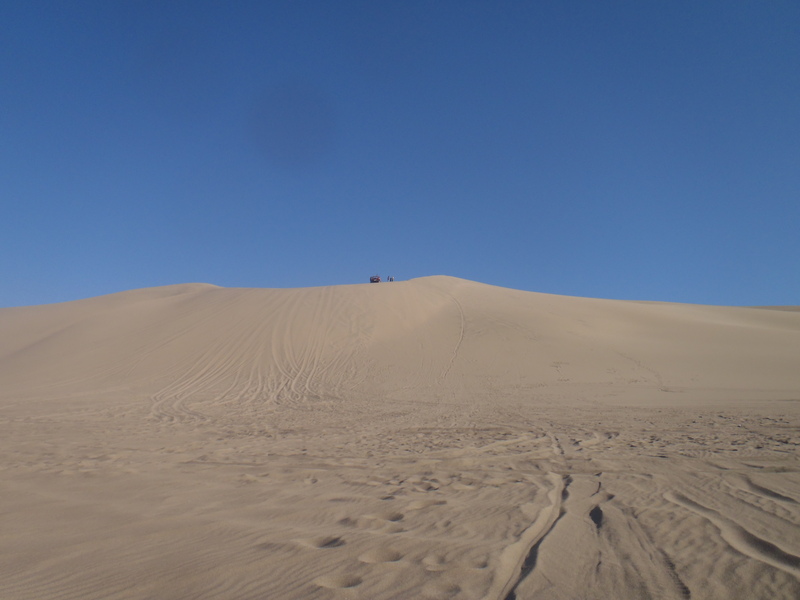 We did the dune buggy and sandboarding as part of a tour of the area south of Lima, which included the Paracas Reserve and the Nazca Lines. It was a 3 day, 2 night tour. There is a lot to see in this area so getting a tour is the easiest way to fit it all in. 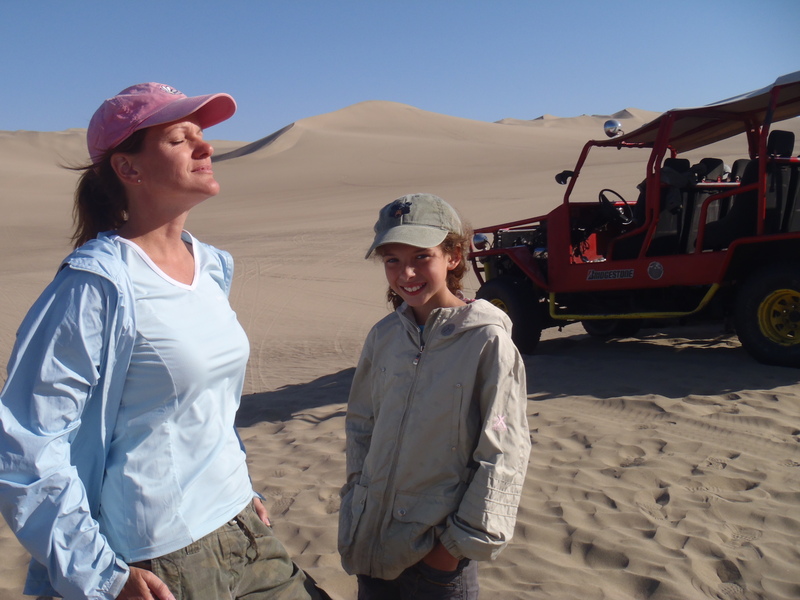 They pick you up in Lima and take you to all kinds of sights, including a pisco vineyard, the Ballestas Islands and the cemetery of Chauchilla (the Nazca lines and cemetery were both in the newest Indiana Jones movie – the Kingdom of the Crystal Skull, if you have never seen them.) We used http://www.mysteryperu.com/eng/co_paracas.html as our tour company and they were very good.